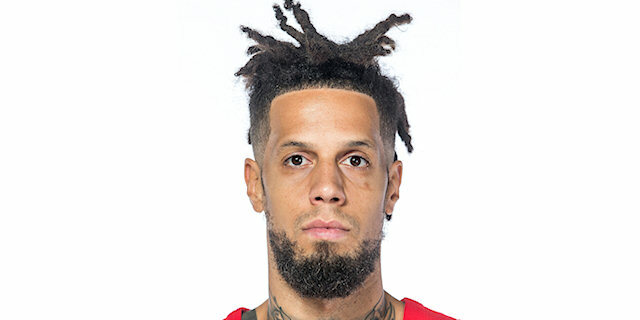 In a must-win home game to restart its playoffs expectations, Olympiacos Piraeus fired on all cylinders at both ends of the court to register a resounding 82-68 victory over visiting Laboral Kutxa Vitoria Gasteiz on Friday. 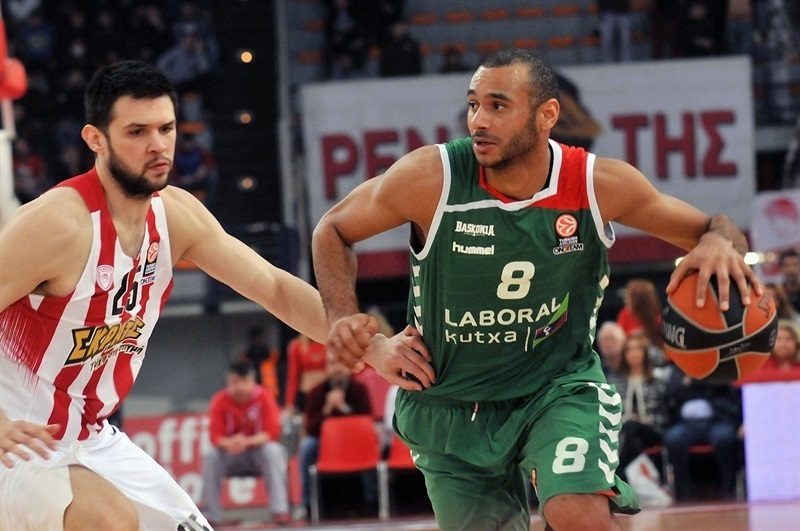 Olympiacos improved its record to 4-5 in Top 16 Group F, while Laboral remained in second place at 6-3. With its second victory over Laboral, however, the Reds will win almost any tiebreak should the teams finish with the same record. 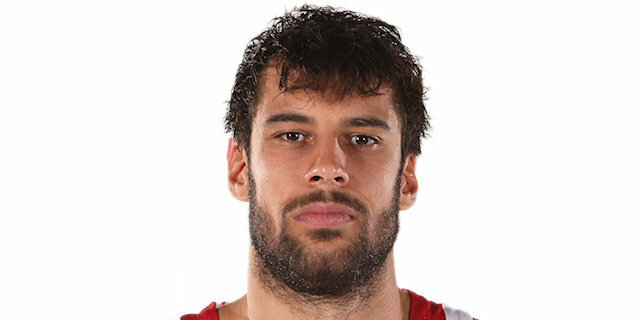 Georgios Printezis scored 13 of his team-high 17 points in the first quarter as the Reds turned around a slow start. Another 16-0 blast in the second provided game-long double-digit leads that Laboral cut to 71-63 on late, back-to-back triples by Davis Bertans, but there the threat ended. 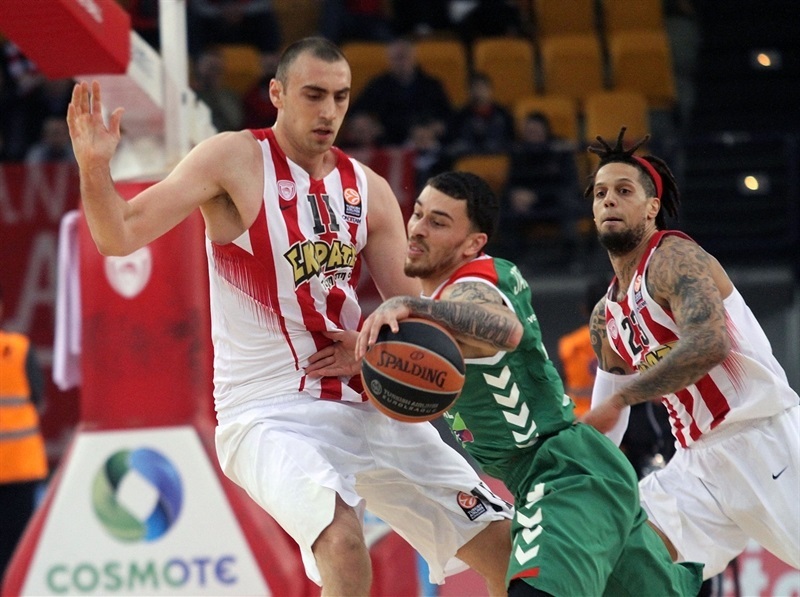 Vassilis Spanoulis added 14 points and 8 assists for the winners, while Ioannis Papapetrou had 11. 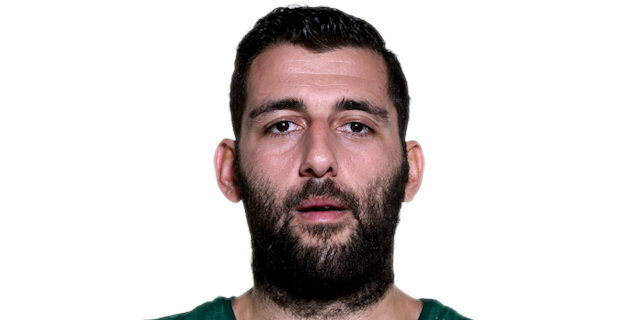 Former Olympiacos player Ioannis Bourousis led Laboral with 19 points and 7 rebounds, while Bertans added 11, Mike James and Jaka Blazic 10 each. Adam Hanga was fed by Darius Adams for a reverse and Fabien Causeur drove for another basket in close to start the scoring for the visitors. After Spanoulis fed Othello Hunter to put Olympiacos on the scoreboard, Hanga picked up a loose ball and drilled a triple to give Laboral a quick 2-7 advantage. Printezis downed a free throw before Adams and Hanga connected on another easy basket at 3-9. 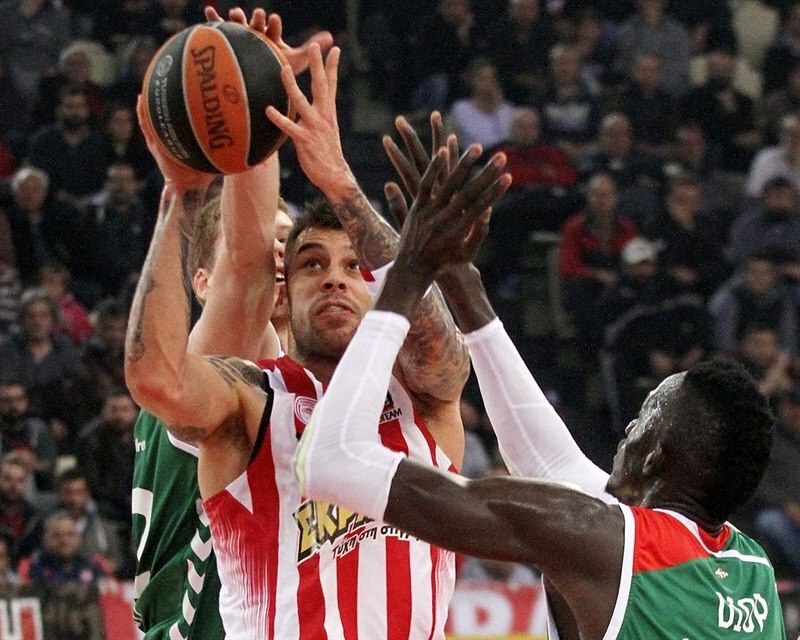 Printezis responded with a pair of shots in close to pull Olympiacos within 7-9. Printezis continued giving footwork lessons in the paint and hit go-ahead free throws. Spanoulis fed Hunter again before Vangelis Mantzaris assited Printezis on a fastbreak layup to make it a 12-0 run and a 15-9 lead for Olympiacos. Out of a timeout, Bourousis buoyed Laboral with a hook shot and soon got to the foul line to make 1 of 2. Printezis made 2 of 2 free throws before Bourousis hit a fadeaway. Printezis fed Nikola Milutinov for a layup and Blazic answered with a triple for Laboral that ended the first quarter with a 19-16 scoreboard. Bourousis faded away on the baseline to make in 19-18 at the start of the second quarter. Daniel Hackett turned a short jumper into a three-point play before James hit a mid-range shot for Laboral before Darius Johnson-Odom swished a step-back three to make it 25-20. Laboral tied it quickly, however, as Blazic first led Bourousis for a dunk then drilled a transition triple at 25-25. Spanoulis made 2 of 2 free throws and D.J. Strawberry fed Milutinov for a layup to make it 31-25. After a Laboral timeout, Spanoulis drove for a gutsy layup. Hakeem Warrick debuted for Olympiacos and seconds later helped force a steal that ended with Strawberry hitting a reverse. Hackett drove hard for another basket, then stole and assisted Papapetrou for a fastbreak slam. 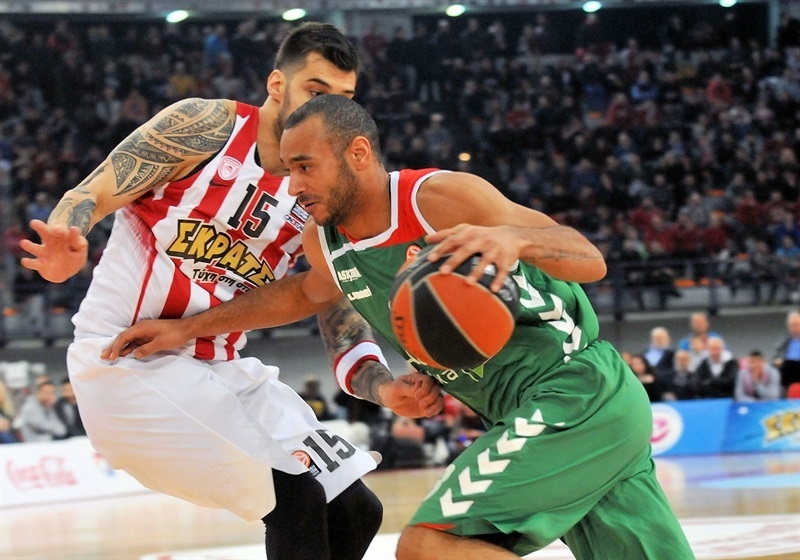 When Warrick dished to Strawberry for a layup, a 16-0 run to a 41-25 lead for Olympiacos was complete. 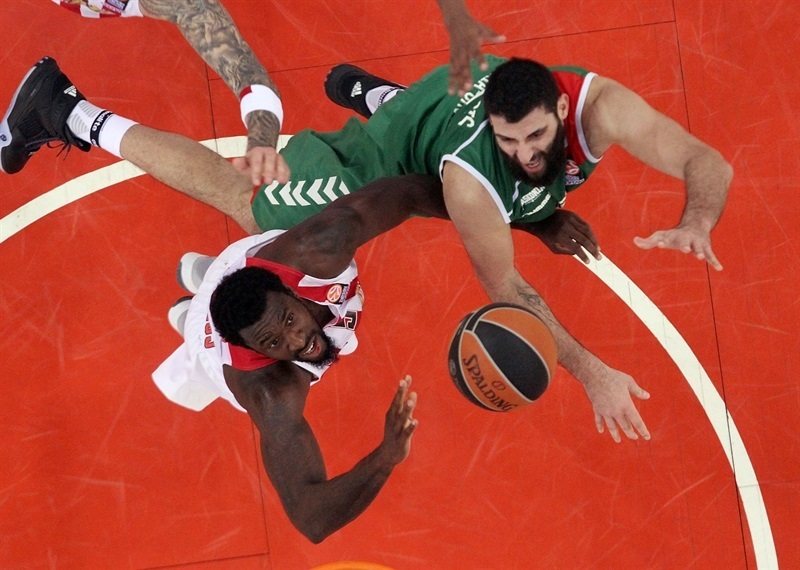 A putback by Bourousis ended Laboral's five-minute scoring drought while Johnson-Odom came back on for Olympiacos to finish another fastbreak. Blazic downed free throws for the visitors and Bourousis made 1 of 2 himself as the first half ended 44-30 for the hosts. Bertans dropped a baseline jumper for Laboral to make it 44-32 in an otherwise scoreless first 2 minutes of the third quarter. Strawberry stopped on a dime and turned his step-back shot into a three-point play before Bertans matched him from deep at the other end. Spanoulis got loose for a triple himself, but James did the same for Laboral to make it 50-38. Printezis returned to the scoring column with his trademark one-hand push shot. 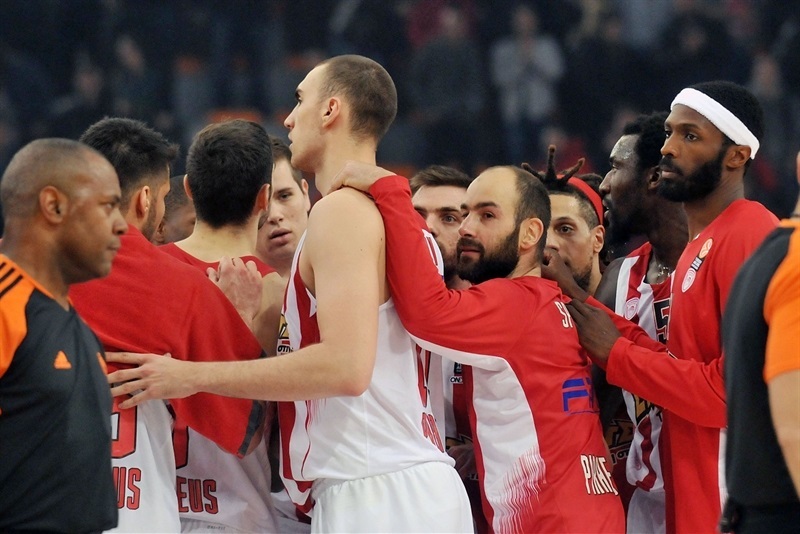 When Spanoulis then shook his defenders for back-to-back layups, Olympiacos was suddenly ahead 56-38. 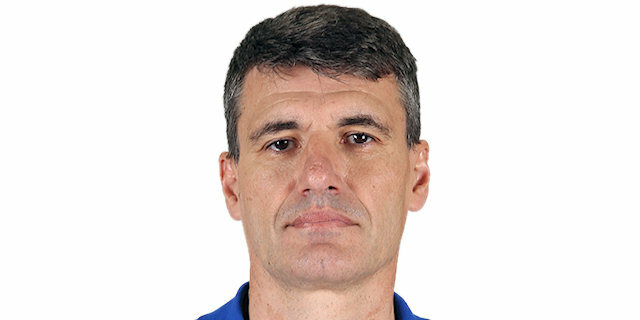 Blazic connected from downtown for Laboral, but was soon matched by Kostas Papanikolaou, with his first points at home since rejoining the Reds. When Papapetrou followed with a layup, Olympiacos had a 20-point lead, 61-41. Adams answered from deep for Laboral before Johnson-Odom detonated a high-speed rim-rocking fastbreak slam. 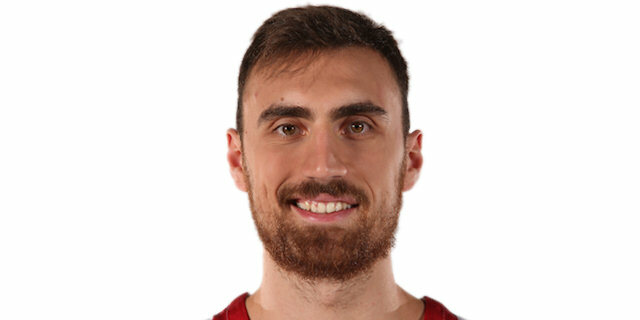 But Adams had another triple in him before the third quarter ended 61-47 in favor of Olympiacos. 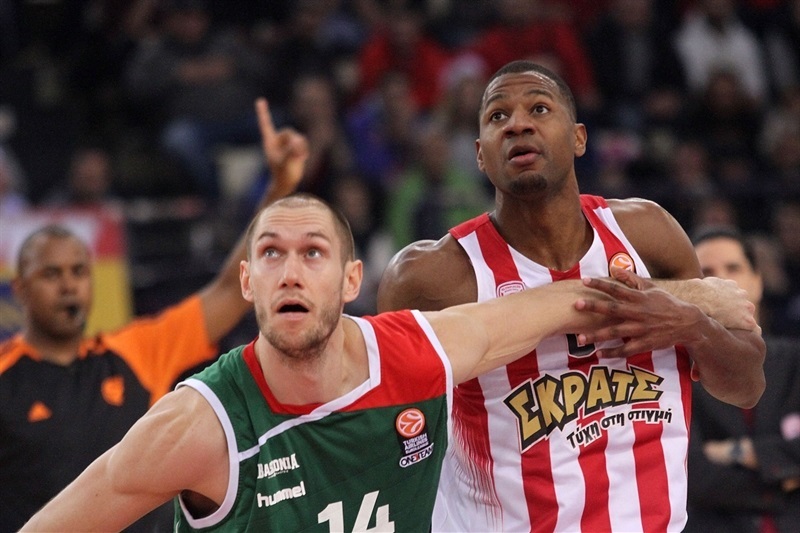 Fourth quarter: Olympiacos closes it out! 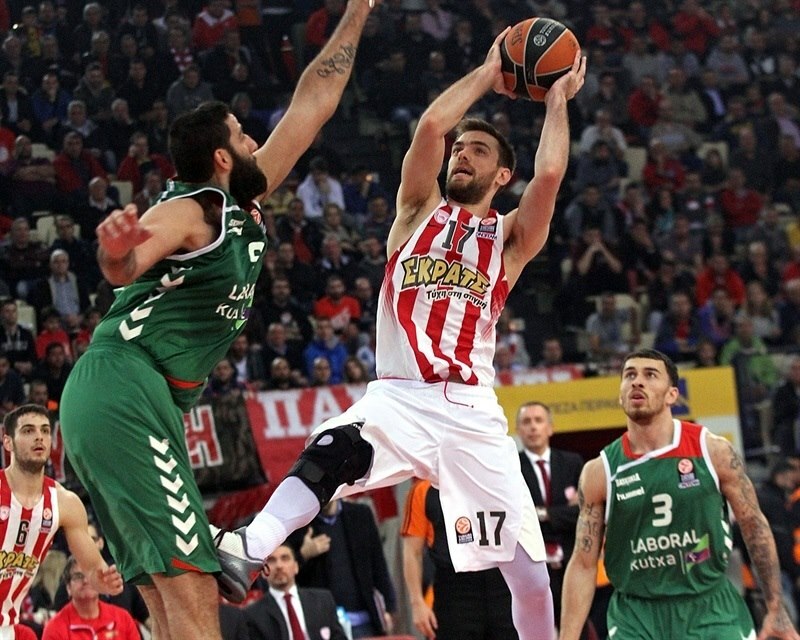 Papanikolaou hit a reverse off a feed from Hackett to re-start Olympiacos in the fourth quarter. And after James hit a triple for Laboral, Papapetrou did the same for the Reds. 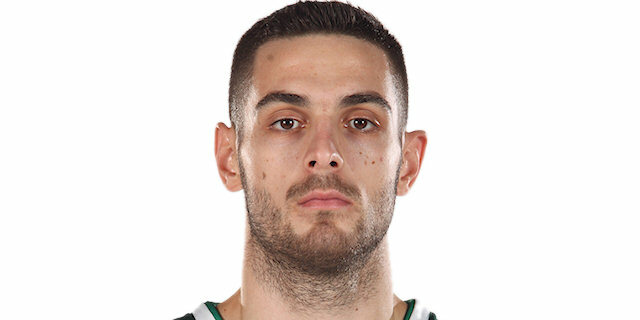 Bourousis backed down for a basket he converted into a three-point play then took a feed from Adams for 2 more points, cutting the difference to 68-53. After a timeout, Spanoulis fed Milutinov, who scored and converted the three-point play at 71-55. 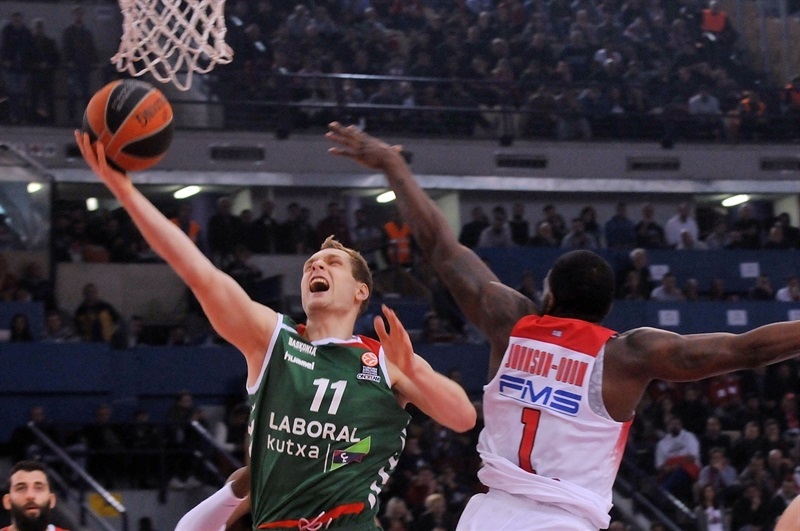 But with 5 minutes left, Laboral refused to go away as James scored in close and Bertans buried a corner triple at 71-60. Bertans came back and did it again from the top before Hunter and Adams exchanged baskets to make it 73-65 with 2 minutes left to play. Hunter then added to the Olympiacos lead with 2 of 2 free throws and blocked a three-point try by Adams. When Spanoulis drove for a patented layup, the Reds were ahead by 12 again, 77-65, and on their way to a victory that could be good as gold if these two teams tie at the end of the Top 16. "We would like to return to getting victories, so we are happy because we combined this win with a very good performance. I think that we deserved to win because we controlled the game thanks to our defense and limited a great offensive team. We played with a lot of energy and found the rhythm that gave us the opportunity to score on the open court. This is the way to continue in the next games. All the players tried hard to help the team and I appreciate it very much. Warrick is playing mainly at center and it is not easy for a newcomer to play two positions. He needs some time to get adjusted to the team and we need him as a center. Darius Johnson-Odom offered a tremendous highlight, which is included to his repertoire. He has strong legs and can be a key factor in our defense." 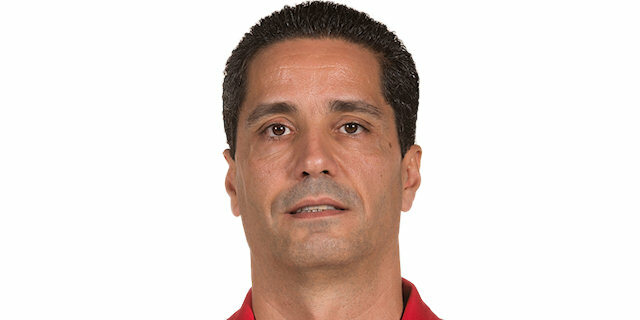 "Congratulations to Olympiacos for their victory. They deserved to win because they have been tougher and more concentrated than us. We lost the game when Olympiacos made a 12-0 charge and took the lead. Since then, we tried to react but it didn't work out versus such a solid opponent. Regarding Bourousis, I have to say that he has big motivation to play well in each game. He is very good in practice and this is the key for him to play great in all the games." "When you have consecutive losses and don't play well, you feel the obligation to change the situation. We never stopped believing in ourselves and hope that we are able to bounce back. Tonight, we had a lot of energy and spirit. We forced them to make many mistakes and bad shots. Every player was ready to attack and if we play like that, we don't need to be afraid of anybody." "It came to a matter of pride tonight for us. After we lost to Barcelona, we had to win tonight and make a new start. We improved our defense, which is our trademark, and found the rhythm in offense. I don't agree that we have five more finals to play. We have just one against Brose Baskets Bamberg and have to win it. Then we will have another one and another one. One game at a time, this is the way to approach the situation "
"It is a very important victory and I hope that it can drive us in the future. We played great defense, which gave us the opportunity to get some easy points on offense. This is the right way to play in the next games, which are very crucial." "We played really well. We were concentrated most of the time and this is most important. We continue now five more finals. We won the first one and we continue for the second one next week against Bamberg. We have to see each game by game in a different way. That’s the most important. We have another five finals if we want to continue to the next round. So okay, we have to look forward. That’s most important for our team. We hope everybody will be healthy and play better game by game. " "It has been a very difficult game and we knew what to expect from Olympiacos. They had to deal with a must-win situation and did it. We still keep second place and have three home games to play. I am optimistic that we will make it to the quarterfinals, which is going to be a great success for our team. Since we downed Barcelona and Real Madrid, we feel that our appetite has grown."